There is a growing problem for school aged children that was once a simple right of passage – the backpack. Due to increasing homework assignments and fewer lockers many children carry heavy bags to/from school. Those heavy, overloaded backpacks can cause neck and back pain, muscle spasms and spinal subluxations in children. Your child’s loaded backpack should not exceed 15% of their body weight – so pack only what they need. If they are leaning forward under the weight to carry the backpacks, it’s overloaded. To put it on correctly the child should bend at the knees, using both hands lift he pack and be sure to use both shoulder straps. The pack should be snug and if it comes with a waist strap it should be used. Spinal problems are more likely to occur if the pack is carried by straps that are too loose, by only one strap, or if the weight is resting near the small of the back instead of being distributed over the length of the pack. 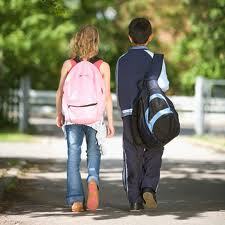 Children that are carrying heavy backpacks through the school year should be under regular chiropractic care. They will be better able to deal with the mechanical stress involved but they will also be able to enjoy the health benefits of a properly functioning spine, nervous system and body.